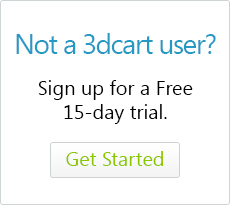 3dcart will automatically compile statistics of each customer that shops on your store. These statistics can be viewed in the individual Customer profiles contained in your store. To view customer stats, go to the Customers link on the left hand navigation. Then select or search for the customer record and click on the customer's name (You can also look to the far right of the customer record and click on its "Action ->Edit" button). While viewing the customer record, click on the Stats tab. Average total price of each order.Customer Rank: Ranking score based on total amount spent in your store. The date the customer first purchased something from your online store. The payment method used on the last purchase. The shipping method used on the last purchase. A listing of previous IP addresses that the shoipper originated from. The customer's ranking among your entire shopper base. The URL that referred the customer to your store for the first time, i.e. search engine or web page. The last date the customer made an order. On average, how often the customer places an order. This graph displays the total value of each sale and the date each order was placed.